I’ve been brainstorming a design for a new home-brewing system. I’d like it to be capable of both recirculating (RIMS) and stepped-infusion mashes, and to have a large degree of automation. If I actually follow through on all my ideas (which would be the first time), it would probably be a system that Labbatt’s would envy. Fairly large orifice, at least 3/8″. If a piece of malt or grain husk gets in there, we don’t want the valve to clog. Withstand mash temperatures, up to 175F. Need to be able to operate with only a few PSI pressure. This rules out many “piloted” type solenoid valves. Food-grade. Ideally NSF-certified. No brass, preferably stainless steel. You can buy solenoid valves that meet these requirements, but they cost $$$. Typically over $100 each for diaphragm valves. Electrically-actuated ball-valves would be even better, because of the big and smooth orifice, but they’re into multiple hundreds of dollars each. Most RIMS brewers who try to go automated seem to just give up and use much less expensive brass-bodied diaphragm valves, use that “pickling” process to get rid of the surface lead, and pray. Only one wetted material: the tubing itself. Pinch valves are popular in high-purity applications like pharmaceuticals for this reason. Very large and smooth flow path when open, basically equal to the size of your tubing. Resists clogging even with chunks in the fluid. Can close even around solid chunks in the fluid. This is why they use them in waste-treatment and other kinds of slurries or dirty liquids. Mechanically very simple. Can be built at home. Now, you would think that a pinch valve couldn’t handle much pressure, and you’d probably be right. But if I use the fairly standard March 809-HS type of pump, then I don’t have much to worry about. It’s an impeller-type pump, and March Pumps claims they can produce only about 12ft of head. Given that 1ft of water column is equal to 0.433 PSI, that means the March 809-HS pump is maxing out at about 5 PSI. If I can get a pinch valve to hold 6 PSI reliably, then that’s good enough. Truthfully, the valve probably won’t ever see the full pressure of the pump, since generally at least one path would be open. Otherwise, I would turn the pump off. I decided to try to prototype one, to see if it would work. I looked in my junk drawers, and found an old 24VDC solenoid of indeterminate strength, and a DC power-supply that could drive it. And a short length of 3/8″OD latex “surgical” hose. I wouldn’t use latex hose in the final project, because of its short life and the rubbery taste it gives; I’d probably use something like the silicone hose that Austin Homebrew sells; I suspect it would be similarly flexible to the latex hose. I banged up a klunky pinch-valve mechanism out of wood. Basically, the centre block is fixed. 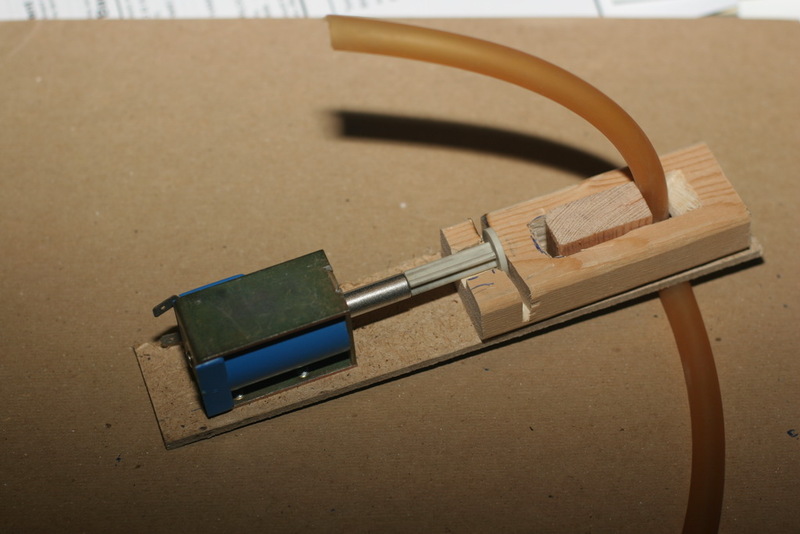 The solenoid pulls on the outer block, which then squeezes the tubing against the fixed block. The outer block has a V-shaped ridge to apply a more focused force on the hose. I hooked it up to my CO2 regulator to test it for leaks. Sadly, it does leak, even at 5PSI. But I’ve got a couple more ideas to improve it. I can try putting that V-shaped ridge on both the moving and fixed blocks, thus getting a more focused force on both sides of the hose. And I could also try to figure out just how strong this solenoid is, and maybe try a stronger one. My thought would be to use a DC motor and worm gear to tighten a screw that pinches the hoze… much like the pinch-clamps that are screw driven (I can send you some). DC motors are dirt cheap. Worm gears are also very cheap (Princess auto!). Also, instead of pinching the hoze between a V and a Nothch, try looping the hose through the pinch mechanism so that it pinches the neck of the loop rather than just the walls of one segment of the hose. P.S. If you want something milled or turned, drop me a line. I’m getting good with stainless. What about PTFE or Nalgene valves used for science equipment… they’re chemcial resistant and temperature tested. They also have hoze barbs and other features built in. Try looking at industrial controlled propane vales, I am using them to control , the fire , but they come in many styles, we use PE or PTFE pipe in the propane industry. I thought about both ideas. Ball valves can be very stiff sometimes. To open a ball valve, you’ll need either a huge force, or a really long stroke, depending on how far out the lever you connect the solenoid. Also, to close the ball valve, you’ll need either a stiff spring (which would increase the force requirements of the opening solenoid), or another solenoid. For every bit of mechanical advantage you get from a lever, you need a correspondingly longer stroke. You can buy electrically-actuated ball valves (very expensive). I think they all use a motor, not a solenoid. Probably with a lot of gear reduction, I’d guess a worm-and-wheel gear, since they give a large torque multiplication in a small package. It would be interesting to try to prototype an actuated ball valve using a small motor and a recycled guitar tuning peg. I am engineering in my head a computer-controlled home brewery as well. I do plan to use 1/2″ ID silicon hose. I was looking at some 35$ brass solenoid valves 1/2″ NPT on ebay. As it happens, I have 6 large hi-torque servos (for 1/4 scale RC airplanes). They are PWM controlled, an easy task for a hobby microprocessor. I’m sure I can rig them to pinch silicon hose. You have to be careful with most solenoid valves you find. For one thing, just because it has 1/2″ NPT connections doesn’t mean it’s 1/2″ all the way through. Piloted solenoid valves have two potential problems for our purposes. First, the channels for the pilot flow can be very small and may be clogged by bits of grain. Second, if the inlet pressure is not high enough, they will fail to operate. They may fail to open, or they may fail to close. Any updates? I stumbled across your site while trying to find 3 piece sanitary solenoid valves you can take apart and clean. I had a few problems, one the sanitary as mentioned and another was the flow rate which seems to be solvable by pinch or some other valve which can be able to be adjusted instead of only open or closed. Seems like you should be able to take flow rates and time and write a program that’ll make whatever beer you want whenever you want. With manual over ride of course until fail proof. Researching this very subject, but I am mostly interested in flow control vice on and off. Anyone know of a valve that can vary the flow rate of your run-off while cooling with a plate chiller? On the ball valve physical turning note, You could use a jack screw setup which has tons of low end power and slow movement. I am thinking about this very thing to control flow. temp high, two seconds of negative turn…etc.